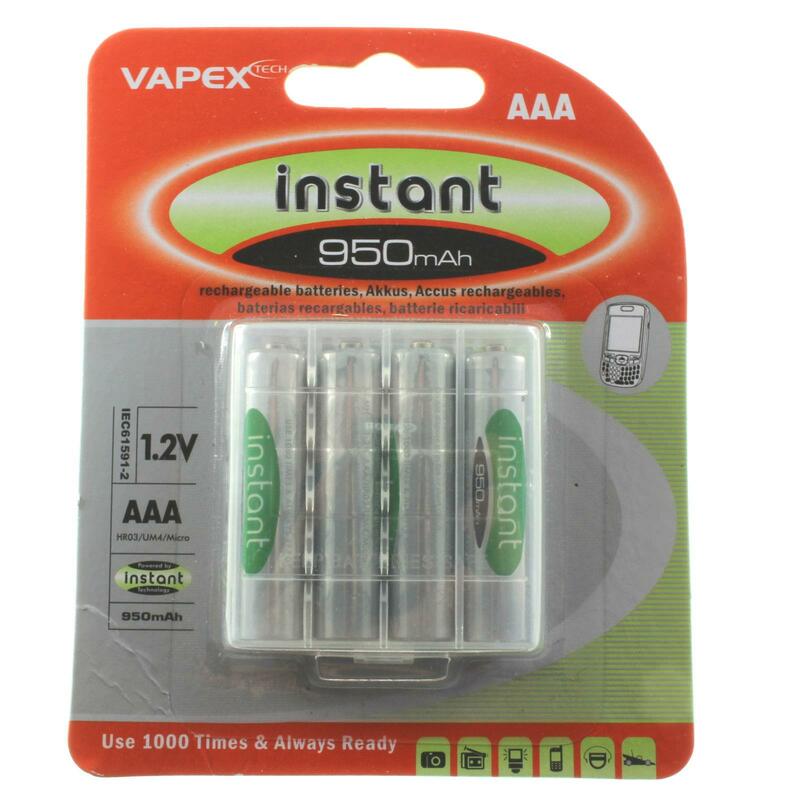 Vapex-Tech Instant 950mAh AAA (R3) rechargeable Nickel-Metal-Hydride (NiMH) batteries - a reliable and long-lasting source of energy for everyday electronic devices that require a long-lasting power source. 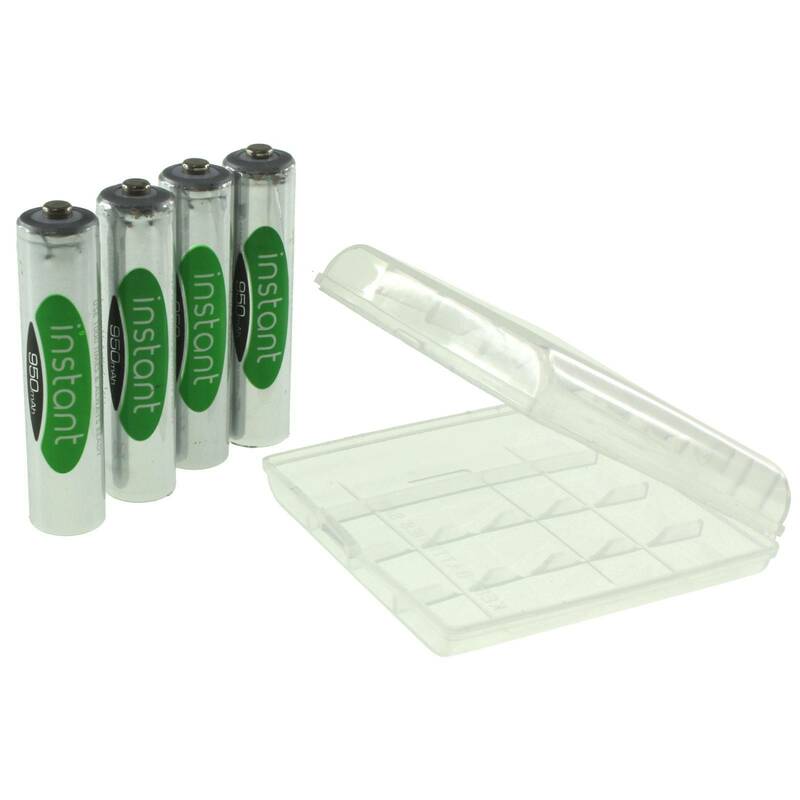 The set contains a transparent plastic box for convenient and safe storage of batteries. 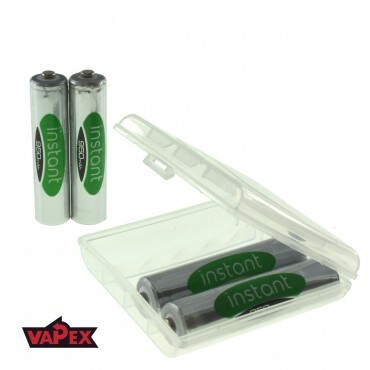 REPLACE SINGLE-USE BATTERIES - The Vapex Instant rechargeable AAA batteries are perfect replacement for alkaline batteries. Use it with any high drain electronic devices like digital cameras, TV remotes, kids toys, flashlights, alarm-clocks, toothbrushes, shavers, gaming controllers, computer mice and keyboards, CD players, portable audio devices, 2-way radios, PDAs, and other portable high drain digital electronics. LOW SELF DISCHARGE - The Vapex Instant AAA size battery has built in low self discharge technology that prevents it from losing its power after long storage periods. Once charged, it can be stored for 12-24 months with a high capacity percentage left. Unlike typical and normal NiMH batteries, Vapex Instant AAA battery can retain up to 70% of capacity even if stored for 1 year! ECO-FRIENDLY & MONEY SAVING - Reduce. Reuse. Save. Being one of the most cost-effective batteries, the Vapex Instant rechargeable NiMH AAA battery can be recharged up to 1000 times.The battery pays for itself after 5 charges. So avoid wasting time and money on the disposable alkaline batteries and replace them with our rechargeable 1.2V AAA battery to decrease the waste disposables leave behind. READY TO USE - Ready to use out of the package. Combine the advantages of alkaline batteries with that of rechargeable batteries. 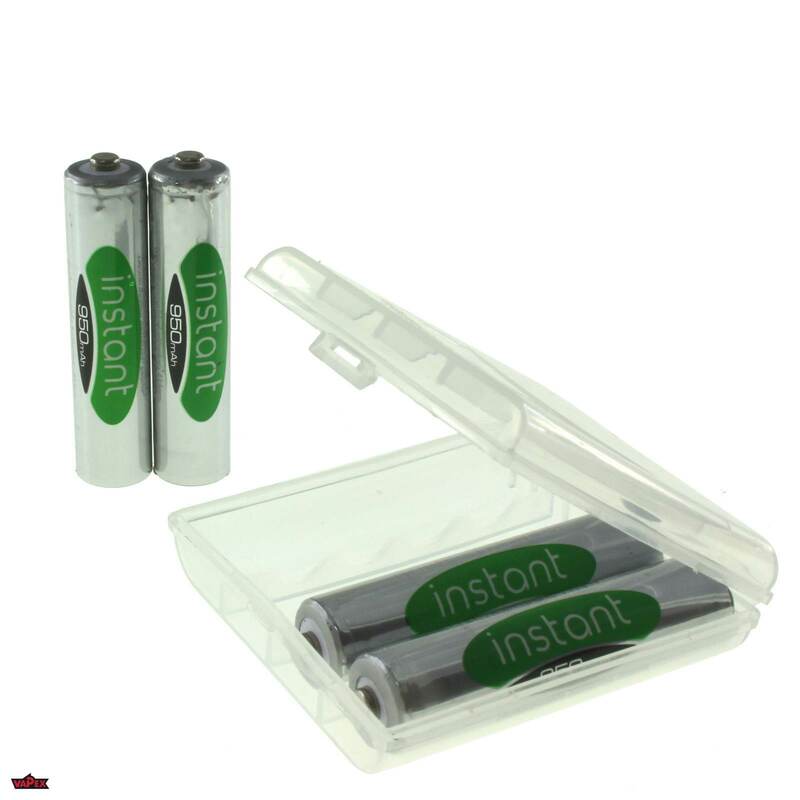 A great household AAA rechargeable battery for any time you are low on power for your battery operated devices. LONGER LASTING CAPACITY - With no memory effect on our rechargeable NiMH AAA battery, charge your batteries anytime. Even when they are only partially drained, you won't have to worry about the long term memory effect and will still get the full capacity after each use. 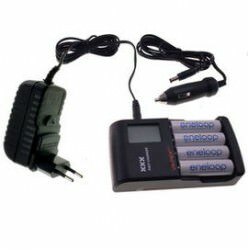 * Continually fast charging at this rate is likely to reduce the life expectancy of the battery, but it is useful that the battery can be charged fast if need be.